The OXO Barista Brain 9-Cup Coffee Maker lives up to its name. The brains behind this otherwise simple drip coffee maker make it stand out from the crowd and deliver perfectly brewed coffee every time. Compared to similarly-priced models of drip coffee makers, the OXO coffee maker offers a superior experience. This is a great maker for anyone looking for an SCAA Certified, elegant drip machine that allows you to brew a large, yet consistently good, pot. What Is The OXO Coffee Maker? Brewing coffee is as much science as it is art, and the OXO Coffee Maker aims to bring these two elements together; yet in a design simple enough that anyone in an early-morning, pre-caffeinated state can navigate the machine and get a great cup. The Barista Brain attempts to mimic the pour-over method of coffee brewing by using a rainmaker shower head. The machine is simple to program and use and comes with a start timer so you can set it up to run as far as 24 hours in advance. It will stop brewing when you remove the carafe and will even mix the coffee, so the densest brew doesn't all land at the bottom. Once you've brewed, a display will let you see how many minutes a pot has been sitting so you know just how fresh your coffee is. 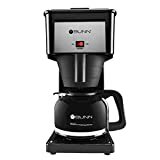 This OXO coffee maker is pretty large with a width of 14.5 inches and a depth of 6.75 inches. It weighs 7.75 pounds and produces 9 cups at a time. The reservoir holds up to 45 ounces of water and is clearly marked for easy dosing. It has an automatic timer and a controlled brew cycle. The OXO coffee machine is not programmable, however, and has no automatic shut off function. The OXO coffee maker does allow you to interrupt in the middle of a brew without spilling coffee everywhere. 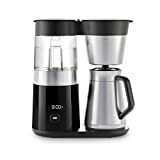 The coffee maker itself is made from a combination of stainless steel and plastic, and the carafe is a solid and pretty much unbreakable stainless steel. The LED screen is easy to see and intuitive to operate. Most notably, the OXO Barista Brain has earned the SCAA's "golden cup" award for always hitting the perfect brewing temperature and timing. The OXO Barista Brain 9-Cup Coffee Maker can be purchased for around $200. For about $200 more, you can get the matching OXO conical burr grinder, which is designed to perfectly match dosages with the Barista Brain,coffee maker. This isn't necessary to thoroughly enjoy the OXO coffee maker, however. The OXO Barista Brain is available directly from the manufacturer, on Amazon, or from sites like Williams Sonoma or Bed Bath & Beyond. The OXO coffee maker really stands out here. For the functionality and features it offers, you couldn't ask for a simpler design. The one button can be both pushed and turned, and there's an easy-to-understand response from the machine's recessed LED screen. A lot of coffee makers fail when it comes to making the water tank both easy to fill and clearly marked. The OXO coffee maker wins in this regard. There's no problem filling it, no problem telling exactly how much is in it, and no problem understanding how much is left. The OXO coffee machine is elegant and sophisticated to look at. The simple stainless steel design means it's easy to clean and durable. There are no sliding baskets that can spill when you attempt to fill, either. The carafe is well-designed and won't spill or drip like some machines if you fail to tip it at just the perfect angle. Furthermore, you can count on that carafe to keep your coffee hot for hours. There are a few things that could be improved. Brewing speed is a bit slow, though still within optimal ranges. This means the resulting brew is going to be too bitter for some. Another factor to consider is the size of the machine. There are definitely good coffee makers out there that won't be such a presence in your kitchen. The OXO Barista Brain comes with one of the best warranties of the bunch. There's a two-year warranty on all materials and workmanship and a promise to either replace or restore your machine if you have the original receipt. There's no requirement to register the product in order to get the warranty. There's no requirement to buy only at authorized retailers. You also don't have to use OXO brand cleaners or descales to avoid voiding the warranty. The Bonavita is an improvement on previous designs and a bit less expensive than OXO coffee maker. It doesn't have the elegant lines of the OXO or Technivorm machines but still delivers consistently good coffee. It has a simple design, is easy to clean, and the thermal carafe delivers. Operating a coffee maker doesn't get any simpler than the Bonavita. It uses standard coffee filters, has a dedicated filter basket, and comes with just one switch. Flip it to start brewing; hold it down for five seconds to pre-soak your grounds and get rid of the CO2. The removable filter basket also presents more of a spill risk than the built-in OXO, and since there's no way to set an auto brew function on the Bonavita, you have to fumble with it when at your groggiest. There's very little that can go wrong with this machine. It's made of high-quality brushed stainless steel. The carafe keeps coffee hot for several hours, though not as long as the carafe on the OXO or the Technivorm. The only real design flaw shows up when pouring from the carafe. You have to hold it just right, or you will get a spill. The warranty is only for one year and does require you to purchase at an "authorized retailer" in order to be valid. You'll void the warranty if you use any cleaners or descalers other than the ones they recommend (read: Bonavita's own brand). The Technivorm is the Starship Enterprise of drip coffee makers. It has a gorgeous design, is made from the finest quality materials and brews perfect coffee every time. It keeps the coffee hot for as long as six hours, but will definitely deliver a hit to your wallet. If you're regularly investing in premium beans, you can be sure that this machine will do them justice. The Technivorm offers a multi-sensory experience of coffee brewing that is a perfect match to the most premium beans. To enjoy everything the Technivorm has to offer, you'll need to pay attention when you use it. For one thing, the carafe has to be sitting perfectly on its plate, or the on/off button won't start the brewing process. While that's a feature designed to protect you, it isn't the easiest thing in the world to use. If you slide out of bed, flip it on, and then slide back in to snooze for ten minutes, you'll be very disappointed to come out and find the carafe wasn't jiggled on just right. That being said, it's very easy to fill the water tank, which is also clearly labeled. It's also almost impossible to make the carafe spill. You won't find better workmanship or materials. The design is both elegant and stylish, and you can even watch the boiling water move from the tank to pour over the coffee. A special tube mixes the coffee as it brews so that the entire pot is evenly dense. As a result, you get the perfect coffee every time. The warranty is for five years and covers materials and workmanship under normal conditions. There is no need to register the product to activate this quite long warranty. However, only the original purchaser can invoke it, the product must be returned in its original packaging, and you have to pay to ship it off to get fixed. The BUNN Velocity is an economical way to get a very decent cuppa. It has a professional rather than elegant look, but is easy to use and produces consistently good coffee with a fast brew. The BUNN is simple to operate and has no surprises. It won't impress anyone with its style, but it will do its job without breaking the bank. If you want to always have coffee, the BUNN is the brewer for you. It's always on, which means there's no need to set anything up. It holds twice the amount of water of your typical machine and keeps that water pre-heated so the coffee can be ready as quickly as possible. It takes a bit of time to warm up, but once it does, it will keep going all day if you let it. Filling the tanks and the coffee filter are both pretty simple jobs. The BUNN is a contradictory little machine. On the hand, you don't expect premium craftsmanship at this price, so it's no surprise that everything about it looks and feels a bit cheap. On the other hand, it delivers surprisingly consistent temperatures and solidly good flavor. The two great design issues are the filters and the controls. There is no display or even a water-level indicator, so filling it can involve a lot of guesswork. You also have to remember to specifically turn it off. Finally, it doesn't use normal filters, so you're stuck with BUNN's proprietary ones. The warranty on this machine is solid. The BUNN Velocity is guaranteed for three years and doesn't require you to buy from an authorized dealer or to register the product. You do have to get it to one of their authorized service centers at your own expense, but everything on this warranty is pretty boilerplate. All considered the OXO coffee machine is our pick of the bunch. Like the Technivorm, it delivers superior taste with an elegant design, but without the hefty price tag. Its ease of use and special features make it more attractive than either the Bonavita or the BUNN. It has a solid warranty behind it with no big strings attached. It's also the only one of the four to earn the SCAA's golden cup award. Use it once, and you'll understand just why.